SPACE – It’s Here, It’s There, POP! Around Annapolis, you never know what kind of fun may pop up. Here’s something to watch for: an ephemeral incantation of a dream. 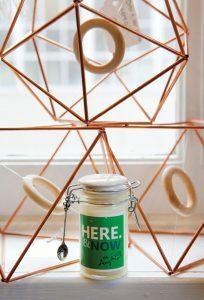 That’s how you can begin to visualize Amy Fresty and Ellen “El” Lunay’s venture, called HERE. a pop-up shop. This plucky pair is doing what others merely daydream—developing a creative outlet into a viable, economic venture. Along the way, they continue to create communities within communities made up of artists and fellow Annapolis business owners and patrons, and extending their creative tendrils in every location where they set up temporary quarters, leaving positive, lingering evidence of their labors. We meet at a busy Annapolis coffee and tea shop one of the last blisteringly hot Fridays of the summer. Chic and quietly confident, Fresty and Lunay greet me with smiles. Lunay bypasses my proffered hand with a raised arm and says, “I’m a hugger.” Fresty, just behind her, does the same, “I’m a hugger, too.” They radiate warmth and nurturing, which may be the secret sauce for their successful enterprise. The initial spark was born of a need and nurtured by friendship: both sets of children were in elementary school at the same time, and their school needed spirit wear, which is gear customized to reflect a school’s name, team, etc., to help the kids show school pride and raise a little money for the PTA. 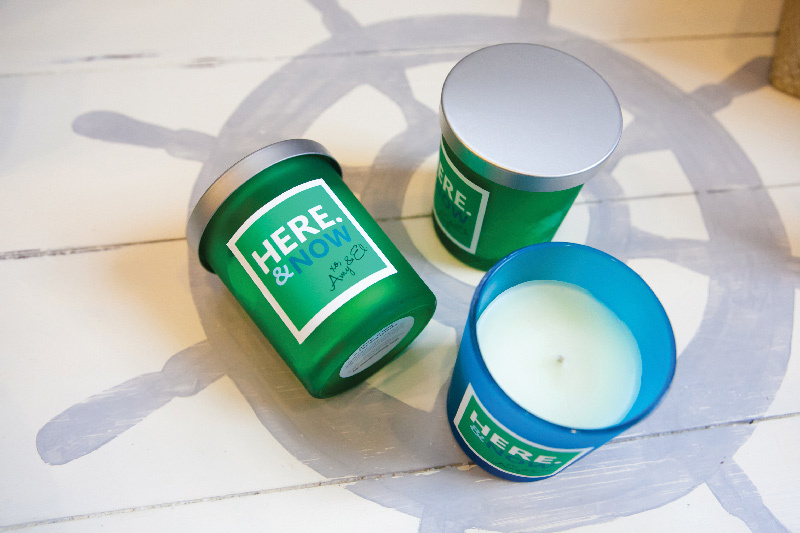 By the second year of accommodating the need, Lunay and Fresty realized how much they were enjoying the creative aspects of designing logos and graphics for items such as sweatpants, T-shirts, and water bottles. Over inspirational glasses of wine, the plan for a pop-up shop crystalized, an ideal business model with low start-up costs for two friends who worked well together and would self-fund their enterprise, with a leap in creative opportunities. Entrepreneurship is not for the skittish, and it can quash the spirit of a creative person venturing into business-building territory. 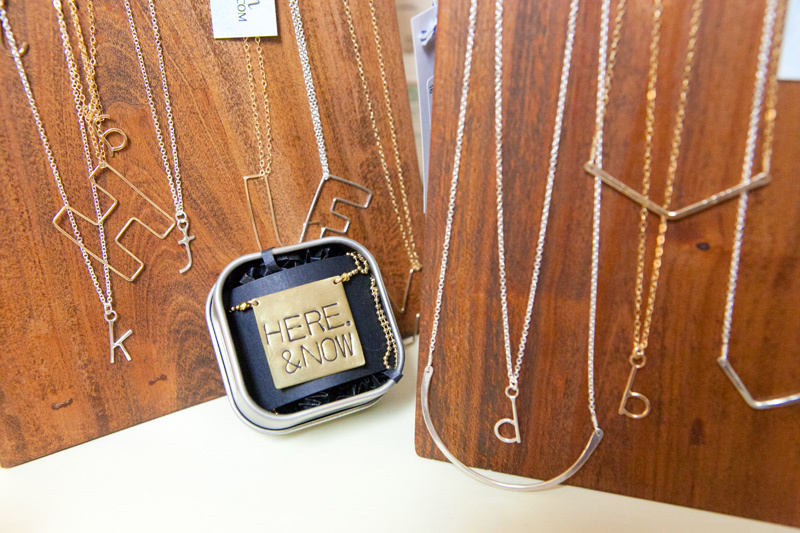 But Fresty and Lunay have been setting up their pop-up shops for four years with no intention of slowing down. By doing so, they have turned a symptom of economic blight—empty storefronts where businesses once stood—into something intriguing and provocative. Their temporary establishments are a literal reminder that nothing is permanent. They take the challenge of working within a space’s current design, under an ultra-short lease, and turning it into an opportunity for a dreamy display. “We get inventory from the artists and set up the space as a boutique—it tells a story. We keep the vibe fresh by changing displays, and it provides different experiences,” says Fresty. “It creates a sense of urgency and excitement,” adds Lunay. Each shop offers a new theme that gives customers an idea of what to expect. Their first was called Lazy Days of Summer, featuring as a focal point a hammock with artisanal pillows and a huge umbrella. Homegrown in Annapolis showcased a boat that was made into a display table using grapnel anchors, some hanging down like chandeliers while others functioned as display props, things like easels for other items. Another display featured mannequins with living-greens skirts. These are but a few examples of the creative twists and turns that Fresty and Lunay take to make each event unique. How do they make it happen? By tapping into the community pulse through social media, old-fashioned but effective print marketing with posters and postcards, grass-roots outreach, and word-of-mouth. About five times a year, HERE. 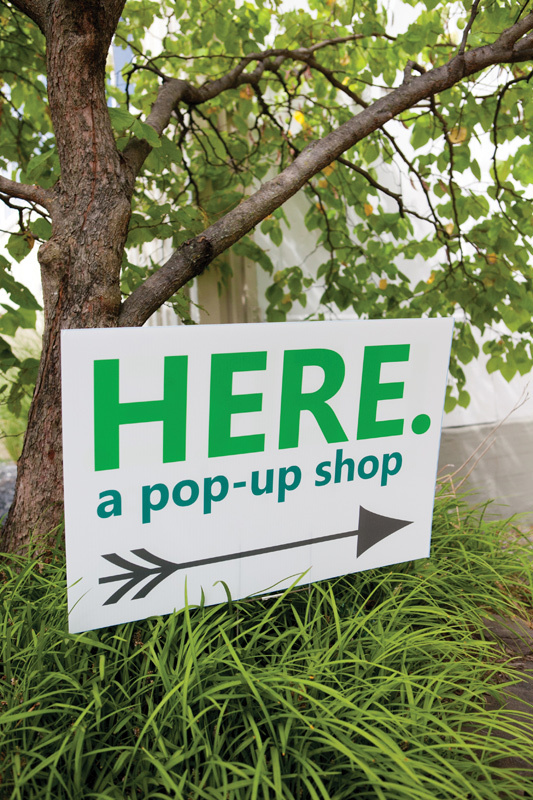 a pop-up shop will pop up at a location—either by invitation or scouting for a temporary space—and remain on site for up to 10 days. They typically host an opening party on the Friday night. Seventy-five to 100 people show up, both faithful customers who follow the shop around town and soon-to-be converts. 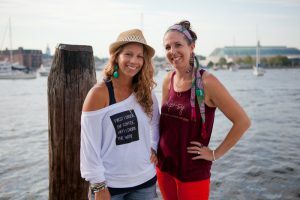 Fresty and Lunay work hard to make the most of their limited time at a site, not only for themselves but also for the artists they vend and neighboring businesses. Prior to opening, they personally introduce themselves to nearby shop owners and offer to collaborate through cross-promotion. Those proprietors can then answer questions about the “coming soon” poster on the nearby building. In return, Fresty and Lunay create community through various marketing ideas. While they are open, for example, customers flocking to their pop-up may also receive special, time-limited discounts for patronizing nearby local restaurants and other businesses. When talking about the beating heart of their business model, their eyes light up. “We love promoting local artists—we’re passionate about their products and the ability to link them to local-based shopping,” says Fresty. Fresty and Lunay keep everything fresh, including their product inventory. As their endeavor grows, it provides them with more creative opportunities, such as adding to their limited-quantity offering of affordable, trendy garments. They work with a core group of artists and artisans that has expanded over the years, and they rotate the supplier roster for each pop-up shop. In turn, the artists and artisans agree to provide new pieces—including jewelry, art, photography, and home, furniture, and gift items—for each event. 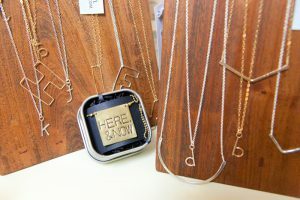 Fresty and Lunay also collaborate to obtain pieces for their signature collection, HERE.& NOW, xo, Amy & El, which offers a sampling of everything. 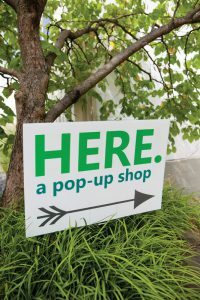 This appeals to customers who come to collect pieces from specific artists and artisans whom they’ve discovered through a previous pop-up shop. Fresty and Lunay also put on smaller events such as store openings and fashion shows. Error: Error validating access token: Session has expired on Saturday, 09-Mar-19 15:57:50 PST. The current time is Tuesday, 23-Apr-19 08:57:02 PDT.